Kenneth Bazzel was arrested by Maricopa Police Feb. 8 on charges of endangerment, criminal damage and disorderly conduct. According to a police probable cause statement, officers responded to a home on West Zion Road about 4:35 p.m. on Feb. 8 in reference to a criminal damage report. A woman told officers her son had a physical fight with another juvenile earlier in the day. She said after the fight on West Rainbow Drive, her family returned home and said she saw a “white chubby male with a blue Detroit hat and a Detroit tattoo” throw a rock through the front window of her house. The man was later identified as Bazzel. When an MPD officer arrived at the scene they observed Bazzel wearing a Detroit shirt and sporting a Detroit tattoo on his right arm. “Kenneth (Bazzel) admitted to throwing a rock through two of the front windows,” the officer wrote in the probable cause statement. He told officers that he threw rocks because he believed the family was harassing his daughter. Bazzel stated he went over to the house “to beat some ***” and threw the rocks at the windows when a woman inside would not come outside, according to the probable cause statement. Officers charged and released the son who was allegedly throwing rocks while Bazzel was arrested and taken to the Pinal County Jail. Shawn Baptisto, 33, was arrested by Maricopa Police on Feb. 3 for violation of court order, theft and criminal damage after he entered a home on West Edwards Circle without permission. According to an MPD probable cause statement, Baptisto entered the property in violation of an existing protection order and he allegedly used an unknown object to break a small padlock on a cabinet on the back patio. Police state in their report that he took “a small electrical sander” out of the cabinet, which was later identified as his property by the victim of the crime. He also took a “turquoise beach cruiser bike belonging to the victim from the property and left the premise,” according to the probable cause statement. While en route to the scene, officers located Baptisto with the bike. He was booked into the Pinal County Jail, and the bike was returned to the victim. Jose Mojarro Parra, 42, was arrested by Maricopa Police Feb. 2 on charges of second-degree burglary, criminal trespassing, failure to comply with a court order and disorderly conduct. Police responded to a home on North Powell Drive shortly after 9 p.m. on Feb. 2. A domestic disturbance was in progress according to the caller, who was Parra’s daughter. Upon arrival officers spoke to the victim, who is the girl’s mother. She told police Parra had violated a court protection order and entered her home without her permission, according to an MPD probable cause statement. Police did identify that Parra had a protection order against him, barring him from entering the property and it listed the victim and his two daughters who live there as protected people. Police located Parra leaving the area in a vehicle and he admitted violating the protection order by contacting the victim at her home, according to the probable cause statement. He said he denied taking possession of the purse and said she invited him into the house. Parra and the victim have been divorced since 2013 and living apart since November 2018. Parra told police he was a Mexican citizen and a legal permanent resident of the United States though the MPD officer wrote, “his claim has not been verified,” according to the probable cause statement. Parra was taken to the Pinal County Jail and booked. Jan. 28, Rogelio Carmona Jr. was arrested by Maricopa Police on suspicion of aggravated domestic violence assault and preventing the use of a phone in an emergency. According to the MPD probable cause statement, Carmona intentionally assaulted his child’s mother and prevented her from calling police for help. The incident occurred at the woman’s home on North Larkspur Drive at about 2:19 a.m.
During a verbal argument, the woman “threw Rogelio’s duffle bag containing his personal belongings in the front yard of the residence and told him to leave,” the report states. The argument continued in the front yard of the home and the woman told Carmona she was going to call the police for help. Carmona allegedly took her cellphone from her hand and pushed her against a vehicle in the driveway. The probable cause statement reads that she began hitting Carmona with her car keys and he let her go, “then begged her not to call the police, stating he would just leave.” Police reported the woman received a laceration to her right hand and she was unsure how she got it. The alleged assault was captured on surveillance cameras outside the house. The footage was impounded as evidence. Carmona was arrested by 2:32 a.m. and booked into the Pinal County Jail. He was also booked into jail on two outstanding warrants from the City of Maricopa. The outstanding warrants had a cash bond of $580.43 and $1,374.38. A man who stands accused of killing a former coworker in Maricopa was recharged with first-degree murder on Jan. 24. Abdullatif Aldosary, 53, allegedly killed Orlando Requena, of Casa Grande, on Nov. 27, 2012, at a train-offloading area on Cowtown Road. Aldosary and Requena were coworkers at Arizona Grain, though they reportedly had not had contact for six months prior to the murder. He is being held on a $1 million bond after his Friday arraignment. Aldosary originally was charged in July 2013 with the first-degree murder of Requena and the Nov. 30, 2012, bombing of a Social Security building in Casa Grande, but those charges were dismissed earlier this month, along with a 2015 charge of attacking a corrections employee with bodily fluids. In July 2018, state prosecutors moved to have him civilly committed to a mental institution. Aldosary was ordered to be evaluated at an inpatient treatment facility by Pinal County Superior Court Judge Joseph Georgini. An appeal was lodged in September. In December, a special hearing was scheduled to evaluate Aldosary’s treatment after an appeals court determined that Georgini’s order forcing Aldosary to take medication was not proper. The hearing was cancelled just before the state motioned to drop Aldosary’s charges. Charges against Aldosary were officially dismissed Jan. 14 without prejudice, giving prosecutors the ability to re-indict him in the future if he proved not to be a danger to himself or others. 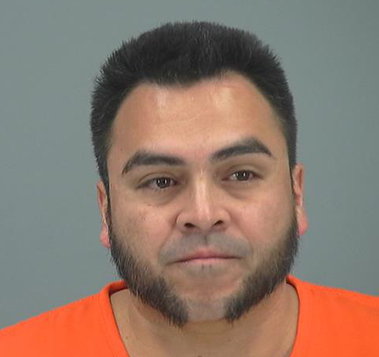 Jan. 16, Aldosary was again indicted by a Pinal County grand jury on three charges, the first-degree murder of Requena, aggravated assault with a deadly weapon against Jesse Montijo and misconduct involving a weapon by a prohibited possessor. In 2014, Aldosary was found guilty in federal court of being a felon in possession of firearms and ammunition and was sentenced to five years in a federal prison. He is scheduled for a pretrial hearing March 6 and remains in Pinal County Adult Detention. Maricopa Police arrested Warren K. Evans on Friday on suspicion of possession of a pistol, which was illegal for him to have as he is on probation for a previous DUI charge, was convicted of dangerous drug possession and served time in prison. Evans was charged with weapons misconduct/prohibited possessor, but during a search of his vehicle during a traffic stop at Smith-Enke and Porter roads around 2 a.m., officers allegedly found methamphetamine, an open container of alcohol and drug paraphernalia. When asked if he was supposed to be in possession of a firearm, he told officers it wasn’t his firearm but his brother’s, according to police documents. The officer made Evans exit the vehicle as he removed the firearm. “As Warren stepped out of the vehicle he put a black case in the bed of the truck,” the probable cause document states. “As I retrieved the firearm, I could smell the odor of intoxicating liquor in the vehicle. The odor was coming from a cup in the center console. Warren admitted it was a Hot Toddy, which is a hot whiskey drink,” the probable cause statement reads. When the officer checked the black case that Evans put into the back, he reportedly found multiple syringes, a spoon, rubber tie-off and a small baggie, which tested positive as methamphetamine. Maricopa Police responded to domestic disturbance call Thursday and instead arrested Boyd W. Monday Jr. on suspicion of possession of a dangerous drug (methamphetamine), possession of marijuana and possession of drug paraphernalia. Officers were called to a residence on West Chambers Road about 2:05 p.m. Upon arriving officers were granted access to the home by a roommate. Police noted the strong odor of burnt marijuana and located Monday in the master bedroom with “numerous items of marijuana and methamphetamine related drug paraphernalia and usable quantities of marijuana. All in plain view in the bedroom,” according to a MPD probable cause statement. Monday admitted ownership of the items and the drugs, according to police. Both the marijuana and methamphetamine field-tested positive as illicit drugs. Dailien Godley, 23, was arrested by Maricopa Police Saturday on suspicion of aggravated assault, possession of marijuana for sale, possession of firearm drug offense, theft of a firearm, disorderly conduct with a firearm and possession of marijuana. At 5:16 p.m. Godley was a passenger in a vehicle which was involved in an aggravated assault complaint. The victim in the case identified the vehicle to police and said Godley pointed a handgun at him. He told police the driver of the vehicle also had a weapon and threatened to shoot him. According to the MPD probable cause statement, during a “high-risk traffic stop” of the vehicle Godley was arrested and a handgun was found hidden inside a panel in the vehicle near the front passenger’s seat. After checking the serial numbers on the gun, officers discovered the handgun was stolen from Phoenix. Marijuana was found in the vehicle next to a scale. The marijuana appeared to be in separate packages for resale, according to police reports. Godley admitted to purchasing the handgun for $250 and ownership of the marijuana, according to the probable cause statement. The driver of the vehicle, Juwaan Henry, was also charged with threatening and disorderly conduct. A woman only identified as Terri by Maricopa Police was arrested and charged Jan. 13 for impaired driving, a blood alcohol level more than .08, extreme blood alcohol levels of more than .150 and aggravated DUI with children younger than 15 in the car. According to a Maricopa Police probable cause statement, about 4:41 p.m. the woman was involved in a crash on Farrell Road, west of Porter Road. Officers report she was driving east on Farrell with her three children and attempted to pass several cars on the dirt shoulder. She apparently lost control of her vehicle and hit other vehicles. She reportedly failed field sobriety tests. She again failed breath tests at the MPD offices, according to the report. She was taken to the Pinal County Jail. She was also arrested on two outstanding warrants for failure to appear in Casa Grande. Her last name was not released by police to protect the identities of the children. 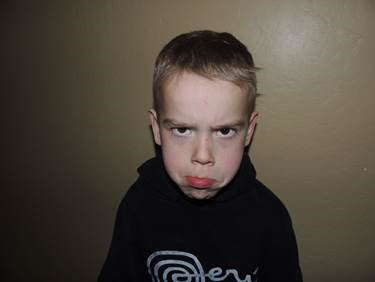 UPDATE: Talon Samascott has been found and safely returned. An 8-year-old boy was reported missing from a group home Friday near Tortosa, and Maricopa Police Department has been searching the area. The Tortosa subdivision and Maricopa Agricultural Center were the main points of interest in the search as officers looked for footprints. According to MPD, Gila River Police have also been apprised of the situation. The boy is described as white with blond hair and brown eyes. MDP identified him as Talon Samascott. Michael Boling was arrested Friday by Maricopa Police for possession of prescription only drugs and drug paraphernalia. Dec. 28, officers stopped a white Saturn sedan for a traffic violation on John Wayne Parkway and arrested the driver of the vehicle, Michael Lee Johnson, on two outstanding warrants. During a search of the vehicle, officers located two Xanax pills on the passenger’s side where Boling was seated. One was on the passenger seat and the other was found on the passenger’s side door, according to the MPD cause statement. Police stated that Bolin also had a black bag in his possession and drug paraphernalia was found in the bag, including hypodermic needles and a “glass methamphetamine pipe,” according to police documents. Bolin was arrested and taken to the Pinal County Jail. Dec. 29 Nadene Maxwell was arrested on suspicion of assault with intent to injure, criminal damage and disorderly conduct after she allegedly attacked her brother. Maricopa Police report Maxwell got into a dispute with her brother that turned physical at a residence on West Michaels Drive. Police state that Maxwell came to the residence to give presents to her children, who her brother takes care of. It began as a verbal argument at the front door when her brother would not allow her to see the children. Police report Maxwell then broke the front window on the house with a rock and remained outside yelling until police arrived. She was arrested and taken to the Pinal County Jail. Late Friday night, officers of the Maricopa Police Department may have found their man. Sean Wilson, 21, believed to be a resident of Stanfield, was arrested by Maricopa Police in Casa Grande and charged for 32 counts of third-degree vehicle burglary and one count of trafficking in stolen property. Wilson is charged with burglarizing motor vehicles between Dec. 22 and Dec. 28 in Maricopa. MPD has investigated a total of 33 vehicle burglaries during the period, beginning with eight reported in the Maricopa Meadows area, according to the MPD probable cause statement. The statement states that officers actually made contact with Wilson in the area on Dec. 22, the first day of the thefts. Only later did they identify him as a suspect in the burglaries. Wilson was released at that time pending a complaint on the possible drug charge. But the Vans would come into play later. Two days later officers investigated a string of nine vehicle burglaries within a one-mile radius of the Cobblestone subdivision. Dec. 26, MPD received another 10 complaints of burglaries within a one-mile radius of Acacia Crossings. After reviewing evidence in the case, including surveillance video from two different locations, they identified Wilson as a probable suspect based on the clothes and shoes the suspect was wearing in the video. The shoes matched the Vans located on Wilson’s passenger floorboard that officers had seen back on Dec. 22, according to police documents. Investigators also found Wilson had recently pawned items that were consistent with items taken in the burglaries. Dec. 28, MPD officers responded to a report of a suspicious person wearing a red jacket in the Desert Cedars subdivision. A caller said the suspect was trying to break into cars about 6:15 a.m. The officer stopped and shined a light on the vehicle and the suspect exited. The officer, who was already aware of Wilson as a suspect in the burglaries, positively identified Wilson as the man exiting the vehicle. Wilson fled the scene and escaped from officers, but police used his cellphone number to “ping” his phone’s location to the Maricopa Walmart. They could not find him there but located him later in Casa Grande by again “pinging” his phone. They went to Casa Grande and located him using his own cell phone as their guide, according to the probable cause statement. Officers found several items believed to be taken in the burglaries in his car as well as clothing and the shoes he was believed to be wearing in video recordings of the burglaries. During later interviews with investigators, Wilson allegedly admitted to committing the burglaries as well as selling and pawning some of the stolen items. Wilson was taken to the Pinal County Jail and charged with the 33 counts and is being held on a $10,000 bond. He is scheduled in Pinal County Superior Court Friday. The story has been corrected to reflect the correct spelling of Soft Wind Drive. So far, 25 unlocked vehicles in Maricopa have been burglarized this week. Maricopa Police have released some information on their Facebook page, including photos of a suspect rummaging through vehicles. Police don’t yet have an approximate value of items taken from the unlocked vehicles but did say items stolen included spare change, phone chargers, tools and even children’s toys, including a stuffed Teddy Bear. Not all victims have lost items. Some simply see clear evidence someone has been in their vehicle. The break-ins are happening in all areas of the city. If you know the suspect or suspects in this crime or are a victim of a crime call MPD at 520-568-3673 or dial 911 if it is an emergency. Diana Nguyen, 18, was arrested Dec. 19 on an accusation of punching her mother in the face after she refused to hand over the daughter’s birth certificate and passport. According to a Maricopa Police Department probable cause statement, officers responded to the Nguyen home on West Colby Drive to find evidence of a physical fight between Diana and her parents. Officers reported they heard yelling coming from within the home when they arrived. They pushed on the door, which opened immediately, and entered the residence. The report stated Diana’s parents came into the living room and started pointing at Diana. The officer reported Diana said she was arguing with her parents because they refused to surrender her passport and birth certificate. “So, Diana told me she punched her mother in the face,” the officer’s report states. There was no physical visible injury to Anna’s face, according to officers. Diana was charged with misdemeanor assault per domestic violence. A Maricopa husband and wife have been indicted by a grand jury on three counts of child abuse. The father, Corey Masterson, 36, was taken to the sheriff’s office adult detention center Dec. 19, the day of the indictments against him and his wife Veronica. At the time of his wife’s arrest a week earlier, he had been taken to a Casa Grande hospital complaining of kidney stones. After the indictments, Maricopa Police Department officers served an arrest warrant on him Dec. 19 at 8:20 p.m. at his home on West Windrose Drive. He was taken into custody without incident, according to police documents. The couple is being held in the Pinal County Jail pending a bond of $50,000 each. The indictments accuse the two of committing child abuse on Nov. 16. The charges are Class 4 felonies. Veronica Masterson is scheduled to appear in Pinal County Superior Court Dec. 28. Corey is scheduled to appear next on Jan. 18. The girl also told investigators when she was grounded, she was not allowed food or water and she hid a water bottle in her backpack. After talking to investigators, she pleaded with them not to tell her parents what she said as she didn’t want the water bottle taken away, according to police documents. “They don’t feed us, and we get super starving,” one of the children told investigators. In the probable-cause statement, the DCS also informed Maricopa Police the mother is currently pregnant, and both parents failed to consent to drug testing. Other allegations included spankings with paddles and belts and the older children being forced to take care of the younger children while the parents were out all night “doing bad stuff,” according to the probable cause statement. The couple lost an infant child in 2013, and Veronica Masterson’s four oldest children perished in a fire last year in Illinois. Tiffany Marquez was arrest Dec. 13 for an outstanding warrant, but Maricopa Police discovered methamphetamine in her purse during the arrest. She was charged with possession of a dangerous drug, methamphetamine, and possession of drug paraphernalia. Marquez was also charged with taking the identity of another after she told police she was someone else when stopped by officers at Maricopa-Casa Grande Highway and Hartman Road about 10:30 that evening, according to the Maricopa Police report. Police towed her vehicle and inventoried the contents of the vehicle. Officers report she was read her Miranda warnings verbatim from a preprinted card and she admitted to possession of the meth and that it belonged to her. She was transported and booked into the Pinal County jail on the charges and the warrants. Three children were removed from their home this week, and their parents were arrested. The 37-year old mother was jailed Wednesday on three counts of child abuse. The woman’s last name is redacted on Maricopa Police charging documents to protect the identities of the children. She is called Veronica on the documents, but police list her aliases with the surname of Lollis and Shaw. Her husband, named Corey in the documents, was also arrested for child abuse but he was reported to have been hospitalized for kidney stones at the time of her arrest and no charging documents are yet located in his case. The girl also told investigators when she is grounded, she is not allowed food or water and she hides a water bottle in her backpack. She pleaded with investigators not to tell her parents what she said because she doesn’t want the water bottle taken away, according to police documents. According to the report, DCS also informed Maricopa Police that the mother is currently pregnant and neither of the parents failed to consent to drug testing. The probable cause statement states MPD launched a criminal investigation based on the findings of DCS. Police confirmed the children’s mouths were rubber banded and duct taped to prevent them from talking. Other allegations like spankings with paddles and belts and the older children being forced to take care of the younger children while the parents were out all night “doing bad stuff,” according to the probable cause statement. The children also told police their mother attempted to kill herself by leaving the car running in a closed garage and that she had attempted to set a fire in their house. The probable cause statement states the mother and father were placed under arrest, and the father complained of kidney stones and was transferred to a hospital in Casa Grande. The mother is currently being held in the Pinal County Jail with a $50,000 bond. It is undetermined where the father is currently located. Cattle being transported through Maricopa “fell out” of a truck Wednesday. Some were injured and others scattered along Farrell Road, State Route 347 and Ak-Chin’s Juan Street neighborhood. 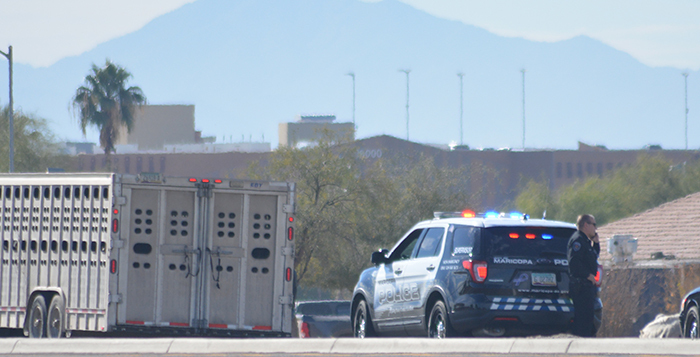 Maricopa Police and Ak-Chin Police both responded to the scene as the cows became a road hazard. Officers found at least two animals immobilized by the accident, with at least one having to be dispatched by the owner. Officers rounded up the cattle while waiting for a transport truck from Stanfield.